We're proud to have just launched a brand-new feature on our website: our Nutrition Calculator. While nutritional information on all of our items has been available on our website for a long time, the calculator takes this data to a whole new level. With the nutrition calculator, not only can you build out your meal from beverages and appetizers to desserts, but you can customize it too, just like you do when you visit our restaurants. Prefer your Chicken Fajita Salad without the sour cream? No problem. Not a fan of whipped cream on your Strawberry Waffle? Take it off and recalculate. 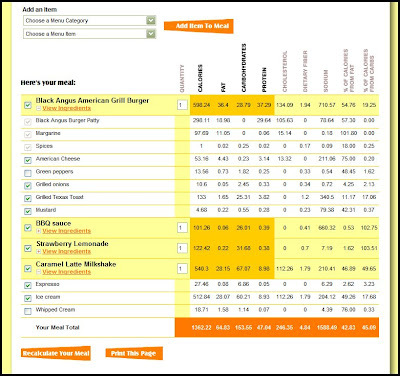 The nutrition calculator makes it easy to build your meal exactly how you like it. The calculator is simple and quick to use. Just choose your menu category from the top drop-down menu, select the particular item you want from the bottom menu, and click “Get Nutrition Info”. You can add other items to your meal in the same way. If you want to remove an ingredient from a particular item, click “View Ingredients” under the item name, uncheck the box of the ingredient you want to remove, and then click “Recalculate Your Meal”. You meal totals will be updated to reflect the change. You can also add condiments to your meal using the “Condiments” menu category. Click here to try it out for yourself, then come back and let us know what you think! Team Smiley joined forces with Rebuilding Together Pittsburgh on April 25 for National Rebuilding Day. Thousands of volunteers across the nation united on this day to repair and renovate the homes of low-income, elderly homeowners. Here in Pittsburgh, the Rebuilding Together team worked at 31 home sites across Allegheny County to assist people in need. The work they provided was free of charge to the homeowners through the generosity of volunteers from corporations, local trade unions, utility companies, schools, civic groups and other community organizations. Team Smiley visited several sites across the city to thank the volunteers and, of course, to give them each a Smiley Cookie! We just finished a remodel of our South Hills Village location, and we're excited to share the before and after photos below. The most notable change has been the addition of our new takeout window. You don't even have to leave your car! We opened our first takeout window at our Monroeville location in October. It was such a hit with guests that we added one to the South Hills Village location. Now, you can call 412-854-4855 to place your order, and just drive up to the window to pick it up! For those of you dining in, you'll enjoy the updates we made to the inside of the restaurant. The photos speak for themselves, so check them out below. I’m Bill Moore - the Director of Safety and Security at Eat’n Park. I have a lot of great memories of Eat’n Park. My grandfather, Larry Hatch, founded Eat'n Park in 1949, so, as you may imagine, this company is an important part of my family’s history. I started with the company in 1979 as a dish washer, and I soon met a waitress who turned out to be the girl of my dreams. I married her 10 years later. My brother in-law met his wife while working at Eat'n Park, too. My wife's parents met at the Bridgeville Eat'n Park as teenagers. In the last 60 years, more than 22 members of my family have worked for Eat'n Park. Last summer, my son Ryan became the 4th generation of our family to work for the company. I take great pride in my family’s history with Eat'n Park, but one of the greatest contributions my family has given Eat'n Park is the Strawberry Pie. My mother came up with the recipe in our kitchen at home. My father, Bob Moore, tested many types of strawberry glazes that were, in his words, "god-awful." He came home and asked my mom, Claire, if she could do better, and boy, did she ever! She made several pies and submitted them to our neighbors in Scott Township. When the comments came back - “too sweet,” “too tart,” etc., Mom hung in there to perfect the recipe. After quite a few rounds and many taste tests later, the neighbors finally all agreed that she had produced a delicious pie. I guess our guests agree, too. It’s become a favorite of so many people. A little known fact about our Strawberry Pie is that Eat'n Park was one of the first places ever to receive fresh strawberries (or any other produce for that matter) by air freight. In 1962, Eat'n Park served fresh Strawberry Pie throughout the winter, with strawberries shipped from Plant City, Florida. At the time, this was unheard of. Another little known fact is that I make the best Strawberry Pie in the company. It must be in my genes! Eat’n Park was born in June of 1949. I didn’t start working at the company until 1951, so the story that follows was handed down to me by my Father-in-law, Larry Hatch. He was the founder of the company, so I can’t think of any better source. In 1948, Larry caught wind of a dining phenomenon that hadn’t yet hit Pittsburgh: the car hop restaurant. Despite the doubts of some of his colleagues and friends, Larry knew that the timing was ripe for a car service restaurant. He took out a second mortgage on his home to finance this drive-in restaurant that he would call Eat’n Park, located on Saw Mill Run (Rt. 51) in the South Hills of Pittsburgh. As far as business was concerned, the opening day of the restaurant was a huge success. Pittsburgh welcomed this new concept in a big way, too. The restaurant caused a huge traffic jam on Rt. 51 and cars couldn’t get into the full lot. My sister-in-law, Betty Brown, worked inside on that first day and throughout that first summer. She told me that all customers were to receive free sundaes with their order, but to keep the waiting customers somewhat happy, the employees delivered free sundaes to them while they waited to place their orders. They even served those in line on Rt. 51. Some of them never got their orders in, but they couldn’t have been too upset when getting a free sundae. So, even on the first hectic day, Larry established the philosophy of doing your best to keep the customer happy. 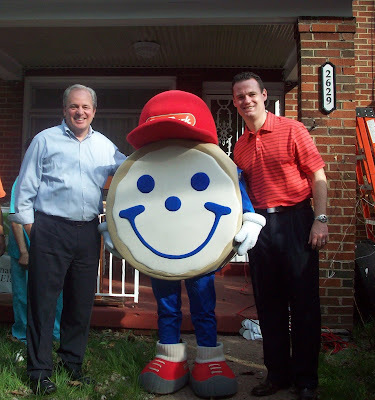 You might even say our roots as “the Place for Smiles” started on our very first day of business!